I have made a little bit of progress on my costumes. Mostly, I wanted to report that I finished the dickey for my Jareth costume. It was kind of a rough ride, but look how it turned out! And here it is with the finished vest! So that's going well. 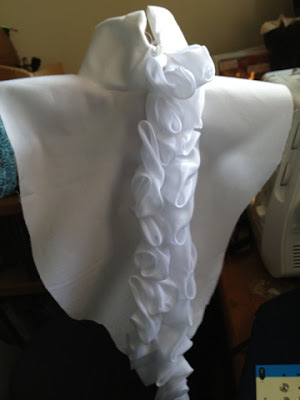 I started working on the coat--the biggest and most intimidating piece (well, the broach aside). Apparently the pattern didn't call for making the coat front with the lapels double sided. As I began to put them together, I realized they needed to be and therefore had to go buy more fabric, which was a bummer. And I couldn't match the color exactly (different dye lot) so I will be working with that. 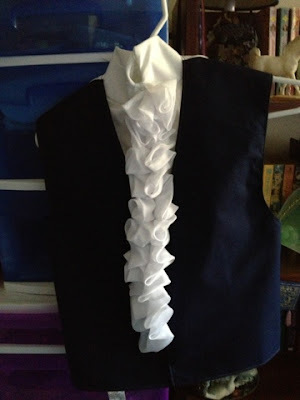 If the inside is the new shade of blue, the lapels will be that color but they will end up covered with glitter and what-not anyway, so it won't matter! That's the idea, anyway, I haven't gotten very far with it yet. I need to order my wig!!! Sadly, no real progress here... That's bad news. But I need Isaac's help for some of it and we haven't had time. And I need to order my Rogue jumpsuit! I found a material that exactly matched the jean dress I found! So I have starting on her little leg warmers and the cartridge holders that go on her chest. I haven't decided how to attach them yet, however. I might have to do some creative sewing. I was going to use orange felt for the cartridges themselves. I think I can sew the jean holders on before inserting the felt. I will keep you posted as I get further along. That's about it for now! I really need to get on this!